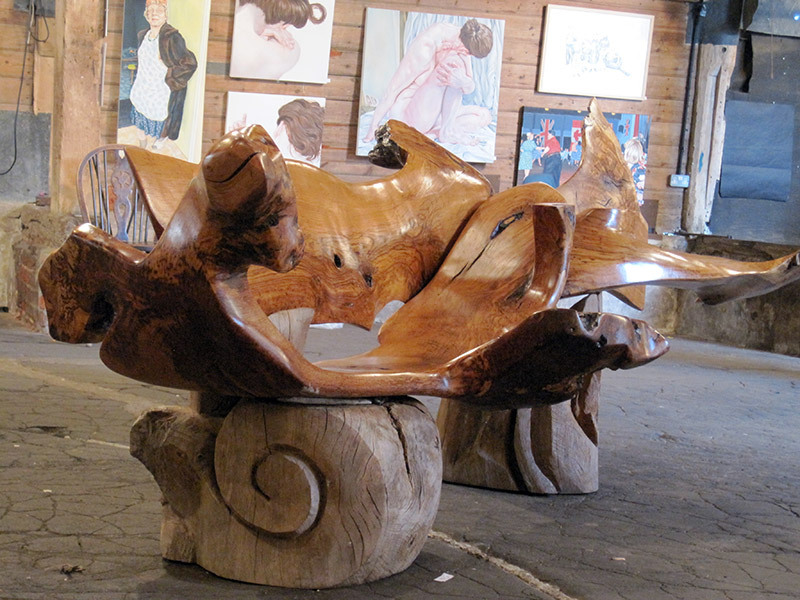 Today, Wednesday 11 September 2013, woodcarver & sculptor Ben Platts-Mills will be demonstrating wood-carving techniques at the Artworks exhibition. Ben says: Sometimes I am given a tree and a story, sometimes just an idea and a place. Or put another way, I make things in public spaces to do with situations and places within limits set by people and materials. Watch Ben Platts-Mills creating exciting & innovative sculpture out of wood, from 10.15 am – 4.30 pm. Stay tuned to the blog for daily exhibition news, as a different artist will be demonstrating in the Artworks exhibition every day. The Artworks annual exhibition is a wonderful opportunity to see and buy new and original contemporary work by some of East Anglia’s most inspired and creative artists under one roof. All the work is for sale. We also have a shop selling artists’ limited edition prints, unframed work, greetings cards and postcards. The Artworks exhibition is open daily, 10am to 5pm, admission is free, ample parking, wheelchair accessible. There is also a café selling light refreshments. We look foward to meeting you! This entry was posted in artworks news and tagged artists, artworks, ben platt mills, demonstrations, exhibition, sculpture on September 11, 2013 by admin.